The Track Dog Racing™ Air Splitter defends your car's end against scraping and cracking. The protective splitter slides over pavement with steep approach angles while your car's flexible urethane bumper or air dam flexes -- without scratching your paint. Made from 3/16" thick, high-impact ABS plastic and built to take a surprising amount of abuse. 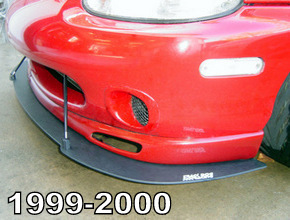 The Track Dog Racing™ Air Splitter for 90-97 Miata defends your car's R-Package lip or Racing Beat Type II bumper from scraping and cracking. 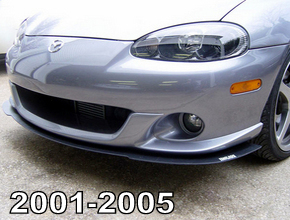 The Track Dog Racing™ Air Splitter for 99-00 Miata defends your car's Sport Package lip from scraping and cracking. 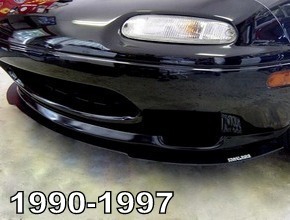 The Track Dog Racing™ Air Splitter for 01-05 Miata defends your car's bumper, air dam or lip from scraping and cracking.